Tahiti is the best place to celebrate your anniversary! Tahiti is part of French Polynesia, which is comprised of 118 romantic islands and atolls. Choosing Tahiti as your anniversary destination will allow you many relaxing days, white sand beaches, and crystal-clear blue waters! There is no better place to be than Tahiti! Tahiti is famous for the spectacular Overwater Bungalow accommodations seen in countless films and photographs! Many of the islands offer gorgeous four-star+ resorts that offer swimming right from your overwater accommodations! Imagine enjoying a leisurely breakfast on your terrace with amazing views of crystal-clear waters and jumping right in when you're done! Yes, it's possible when you make Tahiti your anniversary destination! 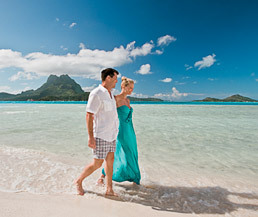 Our Certified Tahiti Specialists call French Polynesia "Paradise on Earth!"! Come discover these beautifully unique islands in the South Pacific, you'll return home with incredible memories of your time together! Discover the sparkling magic of Bora Bora's lagoon. Admire the awe-inspiring Mount Otemanu. All while luxuriating in the peace and tranquility of the surroundings of the five star Bora Bora Pearl Beach Resort & Spa on the island Motu Tevairoa. Package Features: 5 nights at the Bora Bora Pearl Beach Resort and Spa in a Garden Bungalow with Private Pool, Airfare from Los Angeles, Guided Shark & Ray Snorkel Safari, Complimentary Black Pearl Pendant (1 per couple) a as our gift to you, Traditional Polynesian Flower Lei Welcome, Traditional Farewell Shell Lei, inter-island transportation, Daily American Breakfast, & much more! Expect a truly international Polynesia resort as you relax in your overwater bungalow accommodations in Moorea. Package Features: 5 nights at the InterContinental Moorea Resort & Spa in an Overwater Junior Suite Bungalow, Airfare from Los Angeles, Daily breakfast for two, inter-island transportation & much more! To book your anniversary holiday to Tahiti contact Cruising2Tahiti.com!